Here are a few examples of the type of feed back we tend to get. For more please click the link and be directed to our Check-a-trade page. 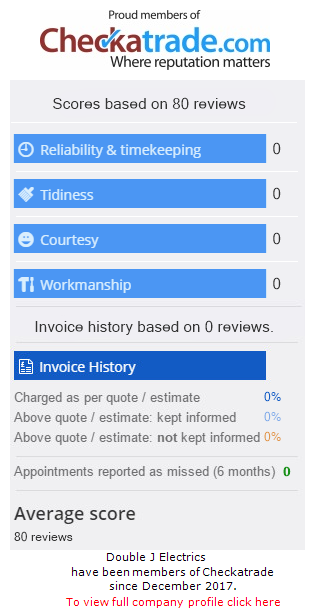 Please Visit www.checkatrade.com/doublejelectricsberkshire for up to date reviews. I'm afraid neither Mark nor I are on Facebook so can't give you a 'Like' on there, but just to say thank you so much for your prompt, efficient and courteous service in identifying the source of our heating problem and fixing it so quickly. You will definitely be our first port of call for any electrical requirements in the future! Thank you very much for sorting out our electrical issues, quickly and professionally, as always. We will defiantly recommend you to friends and family. We are extremely happy to have found such a reliable electrician. Thanks again for your very professional and prompt service. It's great to find a contractor like Double J Electrics who responds to a Client's requirements with a straightforward, 'no hassle' approach to getting the works completed and in a short time frame. We certainly will be calling you for any electrical help or issues we have in the future, and will recommend you to our friends, neighbours and anybody else who asks. A couple of which should be contacting you in the coming weeks. We used Double J Electrics to replace our old consumer unit and carry out a test of our electrical system. Any work involving the whole house can be intrusive, but we were most impressed with Sam’s care and attention and his efforts to keep disruption to a minimum. We are extremely happy with the work that his company carried out. Adam Ollerenshaw - 5 star Sam is a good friend of mine but has done work for me recently. 1st class service, Friendly, reliable & very Professional throughout. I would highly recommend using double j electrics ! David Write – 5 starTruly excellent customer service and great value for money. If you need a Sparky, look no further.